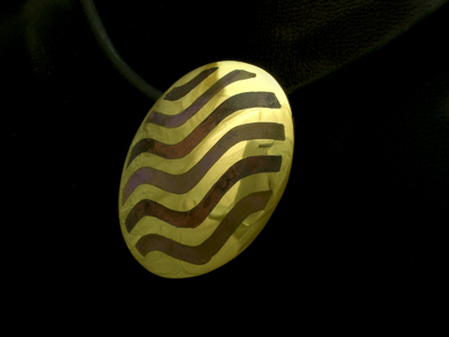 Enamelled and gold-plated silver pendant on a silicon rubber cord. Is it really agate? No, it's enamel; but read on. Confession time (again!). This is a piece that did not go entirely to plan, because I left the it in the kiln for a few seconds too long and it burnt slightly. Over-firing is a recognised technique, though, albeit one with rather unpredictable results, so I decided to polish it up and see how it looked. I'm glad I did because it revealed a very pleasing effect: the enamel had taken on the look of some of the lovely pink/purple agates that can be found in Scotland. The enamel colours are officially coral and mauve. I was going to leave it silver, but my new gold-plating equipment t had arrived, so I gave that a try and, again, I'm glad I did, because it really brought the colours alive. In case you are worried, the gold is completely even in colour. Those variations are caused by reflections (yes, that is me in the mirror!) that I just couldn't avoid because of the combination of the curve of the piece and the shine of the gold. It's finished with a 16" long, 4mm thick rubber cord.